I continue to reiterate that my Government has singled out unity as the key to the successful holding of the referendum and for Bougainville to achieve much progress in the way forward to self-determination and eventual independence. As a matter of fact my department is planning a region-wide patrol for this Government to visit all districts to sit and discuss government policies and programs but more importantly to hear what our communities are saying. Sometime our communities cry foul on us merely because we have not given them the opportunity to be heard and to participate. We need to take heed of the adage “divided we fall, united we stand”. The greatest threat to a progressive and vibrant Bougainville is the people of Bougainville to remain polarized between different groupings such as Meekamui, Kingdom of Papala and Ex-Combatants etc. 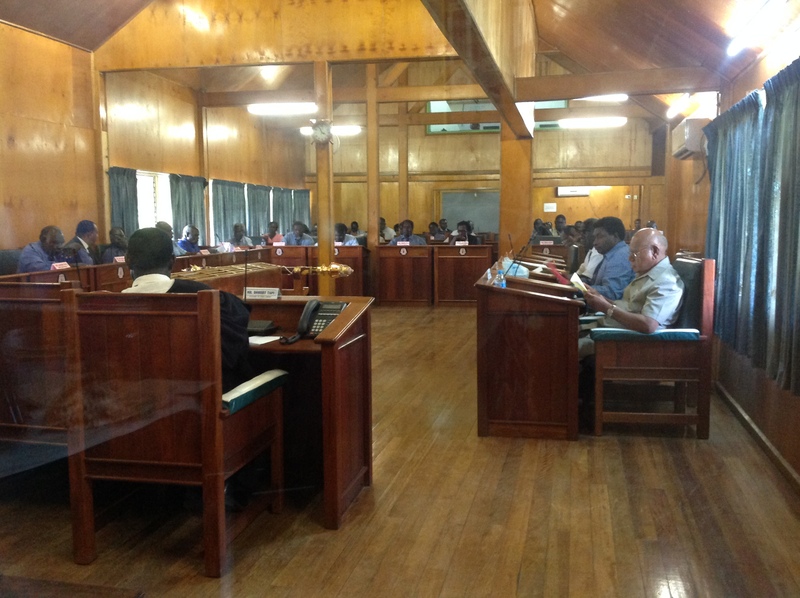 My appeal is for the people of Bougainville to come under the legally constituted entity – ABG. It is a privilege and honour for me to present this ministerial statement as President and the Minister responsible for the Department of the President and BEC. My department as the premier and lead department of the government has an important responsibility coordinating the formulation of Government policy, developing the appropriate legislative framework and implementing government policies to ensure the smooth delivery of goods and services to the people of Bougainville. In the first 100 days of this Government we have moved to implement a number of important initiatives that will strengthen the Government public service machinery to enable it to effectively deliver goods and services to the people of Bougainville and at the same time prepare our people for the most important task that lies ahead of us – the referendum. We are consolidating the work of governing and delivering goods and services to our people by strengthening our public service. Following the appointment of the Chief Secretary as head of the public service early this year, the Senior Appointments Committee of which I am Chairman has confirmed ten permanent heads of departments for ten (10) departments. We have made permanent appointments to the Departments of Police, CIS & Law and Justice, Departments of Community Development, Department of Personnel Management and Administrative Services, Department of Health, Department of Technical Services, Department of Community Government and the Department of Primary Industry. I am confident that the calibre of people appointed to the permanent positions possess the knowledge, experience and qualifications required to ensure that the Departments carry out their mandated responsibilities and functions effectively and efficiently. The Senior Appointments Committee was not able to make permanent appointments to four Heads of Department positions due to the lack of suitable candidates. Together with the newly created Department of Referendum, Peace & Reconciliation and Veterans Affairs this brings the number of departments to five in which we have to advertise and make permanent appointments. The other Departments are the Department of Mining and Energy resources, Department of Education, Department of Lands and Physical Planning and Department of Economic Development. It is important that we have a public service that is accountable to the Government and the people by effectively carrying out its mandated duties and responsibilities to achieve government priority policies and programs. In order to do this, all Heads of Departments will be required to sign performance agreements with the Chief Secretary as head of the public service together with their respective Ministers. The performance agreements hold Heads of Departments accountable to their respective Ministers in achieving an agreed level of performance including certain outputs and outcomes within a specified period of time as per their contracts. At the root of chronic inefficiencies and poor implementation of government policies is the inability of senior management to manage the performance of their departments and of the public sector as a whole effectively. The introduction of an effective performance management system in our public sector will see many improvements and benefits. It clarifies the department’s results and related accountability, it promotes synergy between departments and it encourages transparency by requiring reporting results. Incentives and sanctions will be awarded and instituted accordingly with performance. My government is proposing to develop retention policies as an incentive to retain our experienced retirees who have passed the legal retirement age and still contribute to nation building as a means to address the shortage of skilled manpower problem that we face in post crisis Bougainville. It is clear that the shortage of skilled manpower at the executive, administration and technical level poses a serious impediment to the future progress of Bougainville as a truly self-reliant economy and autonomous region. We need to be more creative to provide incentives to attract Bougainvilleans that work elsewhere throughout Papua New Guinea and overseas to return and contribute to nation building. A number of these Bougainvilleans have also reached the retirement age and we need to be creative in developing policies that will keep them working beyond retirement age and fill in the vacuum. My Government is moving to strengthen the planning and budgeting framework with a view to ensure that government spending through the budget mechanism is linked to and guided by long-term Government development objectives. The planning and budgeting framework also promotes transparency, good governance and accountability in the way public funds are expended. It will also ensure a system of monitoring and measuring performance and effectiveness of government policies in addressing the welfare and social needs of the people of Bougainville. In introducing the planning and budgeting system, my Government recognizes that the Bougainville Peace Agreement is the key and overarching roadmap that will guide our political and development policies and that there are three important pillars that shape the peace agreement are; autonomy, good governance and weapons disposal. This effectively means that the Bougainville Peace Agreement becomes the ultimate guide that governs our relationship with the National Government on the pathway forward for Bougainville. Together with the BPA, focus will also be directed towards, unification, fiscal self -reliance, public consultation & awareness and improved service delivery. As a way forward to coordinate and manage the resource basket available to us, my Government has approved the budget split at 60:40 between development and recurrent expenditure. The development priority sectors together with the percentage splits have been approved as follows; (a) Economic Development (28%); (b) Social Sector (23%), (c) Planning and Administration (13%), (d) and Law and Order (8)%, (e) Infrastructure (18%), (f) Rural Development (10%). My Government has targeted the economic sector as the priority sector that will drive our development agenda. The Autonomous Bougainville Government under my leadership will endeavour to mobilise, organize and empower all people in Bougainville to build self-reliant foundations for the development of Bougainville. I said in my inauguration speech and again remind us today that the Bougainville Peace Agreement is the real basis for us all being here today. It provides us with an exclusive right to self-determination. We can choose and shape our future, a right unique in PNG, and rare internationally. We should celebrate this right, as we do by being here today. The Peace Agreement is a political and constitutional contract between the National Government and Bougainville. It must be honoured in full. The Agreement is not a gift without any strings attached. Instead it will deliver real benefits only if we work hard to make use of the opportunities provided to us. We cannot just sit back and wait for the National Government and donors to deliver us to a promised land. Only we Bougainvilleans can build the new Bougainville we want. We must grasp our opportunities. We cannot ignore the requirements of the Agreement. Without it, we would have no legitimate basis for what we do. We have agreed with the National Government to hold the next Joint Supervisory Board (JSB) Meeting on the 20th October, 2015. The next JSB Meeting will be important as we intend to jointly discuss with the National Government a variety of key issues pertaining to our development roadmap under the Peace Agreement. The referendum issue will be one of the important issues that will be jointly discussed at next JSB. With less than five years left in the referendum window, we hope to reach agreement with the National Government on (a) the key questions to be asked, (b) the common roll to be used and who are eligible to vote, (c) the body to conduct the referendum, and (d) the date for the referendum. It is very clear that time is not on our side and we need to move fast. I am pleased to announce there will be a Referendum Summit held following the JB to be held in East New Britain. The objective of the Summit is to seek a consensus and understanding amongst all the key players from the National Government and Bougainville under the peace process and the way forward to staging the referendum and the aftermath issues following the referendum. We intend to bring as many people as we can from Bougainville to attend the conference in order to give maximum exposure and prepare our leaders for the important task ahead. The next JSB will also provide us the opportunity to raise other important issues with the National Government. These are issues pertaining to the (a) slow pace in the drawdown of powers, (b) tax revenue collections, and (c) the replacement fund to the Special Intervention Fund of K500 million in which the final tranche of K100 million will be paid in 2016. Given the focus of our Government on economic development and fiscal self-reliance, we will propose to the National Government for an investment Development Fund of K500 million over the next five years as a replacement for the SIF. We will also be discussing with the National Government possible funding options and strategies for our Kokopau-Buin Highway. This will be an impact project with huge economic development spin-offs for our enterprising population and an impetus for economic recovery. We must develop our capacity to raise revenue from such opportunities as they present themselves. I continue to reiterate that my Government has singled out unity as the key to the successful holding of the referendum and for Bougainville to achieve much progress in the way forward to self-determination and eventual independence. As a matter of fact my department is planning a region-wide patrol for this Government to visit all districts to sit and discuss government policies and programs but more importantly to hear what our communities are saying. Sometime our communities cry foul on us merely because we have not given them the opportunity to be heard and to participate. We need to take heed of the adage “divided we fall, united we stand”. The greatest threat to a progressive and vibrant Bougainville is the people of Bougainville to remain polarized between different groupings such as Meekamui, Kingdom of Papala and Ex-Combatants etc. My appeal is for the people of Bougainville to come under the legally constituted entity – ABG. I wish to bring to the attention of the House, the latest event held in Panguna on the 24th of September, 2015 in which the main Meekamui faction of Panguna ably led by President Philip Miriori pledged Meekamui’s intention to join the ABG bandwagon in the way forward in search for peace and self-determination for Bougainville. The celebration in Panguna attended by myself, chief secretary and a number of Government Ministers represented a bold and courageous decision by the Meekamui to totally engage with mainstream Bougainville in preparing ourselves for the vote of a lifetime in which all Bougainvilleans will be required to make. The Panguna Celebration also witnessed a declaration by Meekamui General Moses Pipiro that Panguna will be a weapons –free zone in which all weapons will be collected and locked away. The Panguna celebration represented a historical step forward by the Meekamui who has not been a party to the Bougainville Peace Agreement. The Panguna Celebration was an event to mark the declaration by General Moses Pipiro of his intention to bring to a close his self-imposed exile from coming out of the “No Go Zone” and engage with the rest of fellow Bougainvilleans in preparing for the referendum. I wish to salute President Philip Miriori and Deputy Philiph Takaung for the bold, decisive and responsible decision to bring the Meekaui to join the ABG and the rest of Bougainville in preparing our people for the referendum. I wish to congratulate the Vice President and Minister Patrick Nisira and his departmental Secretary Mr. James Tanis, of Peace Building, and referendum Department for working with the Meekamui to make this happen. I wish to take this opportunity to call on other factions of the Meekamui, the Konnou Group and U-Vistract Group to take the same decision and join us. It is important that we all join hands together to ensure we achieve an acceptable outcome the vote is finally taken. I wish to reiterate again my belief that this term of Parliament, the Third Bougainville House of Representatives has been voted in at a very critical time in the political history of Bougainville. We as members need to work with our communities to educate them and prepare them to take the vote of their life-time. We need to work with our communities to make them weapons-free and create a conducive atmosphere as required in the Bougainville Peace Agreement. My challenge to the House is that, the people who voted us in, trusted us to bring a finality to the very important question of self-determination for Bougainville as desired by many distinguished Bougainville leaders who have passed on. The responsibility has been placed on each one of us and I urge all of us to take the opportunity to return the trust placed by our people on each one of us. I am confident that we can do it using the Bougainville Spirit of always standing up for what we think is our right – even if we have to die for it as shown by 10-years of prolonged war. May the blood of those that vanished be not shed in vain. Together as Bougainvilleans we can do it. Thank you and God Bless Bougainville.